An event supported by the Valletta 2018 Foundation. The role of space in Valletta is to enable interaction between different people and support the development of a sense of familiarity and ownership, says Karsten Xuereb, executive director, Valletta 2018 Foundation. 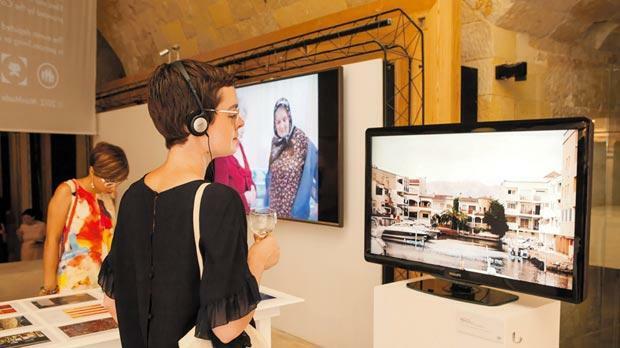 The website of the Valletta 2018 Foundation has a special section dedicated to the infrastructure projects it is directly supporting or facilitating through administrative and communication means (http://valletta2018.org/infrastructure-projects/). It states that the foundation, responsible for preparations for the hosting of the title of European Capital of Culture in Malta in 2018, is working on a series of infrastructure projects which include the regeneration and conservation of a number of Valletta’s forgotten architectural treasures. This declared mission is a core matter for Valletta 2018 for a number of reasons. One is that including the revaluing of the physical fabric of Valletta is a necessary step towards improving the state of the city in terms of functionality by citizens, commuters and visitors. The attractiveness of the city to entrepreneurs and tourists, and as well as the Maltese population, is important in order to reverse the ebbing away of human activity with the city’s buildings and the functions they perform. Another reason is that together with structures like churches, palaces, museums and shops, the revitalisation of hubs for creative exchange and expression is important in this process of instilling new life into these city spaces. Furthermore, the public spaces of Valletta, including squares, porticos, open air restaurants, public and also private rooftops as well as the coastline of Valletta are being further sought by people from all walks of life as a means of enjoyment and escape from the mundane crowded scenes we often experience around various built-up areas of Malta. Nevertheless, the most important element in addressing both aesthetic and utilitarian aspects of the spaces of Valletta is the human one. Valletta 2018 targets different groups with a view to foster interaction between people of different ages, ethnic backgrounds and cultural identities. In so doing, it aims at encouraging access to and participation in various forms of cultural expression. The role of space in Valletta is thus that of providing platforms which enable interaction between different people as well as providing areas which support the development of the sense of familiarity and ownership which existing and new communities in Valletta are seeking again of late. Over the first week of September, Valletta 2018 together with Fondazzjoni Kreattività held the second edition of the Valletta International Visual Arts festival. VIVA was dedicated to culture and communities. International artists engaged with citizens of Valletta and their spaces by exploring different facets of their personal and communitarian journeys inside our capital city. Particular reference was made to two projects. One was The Culture of Ageing, which looks at how different cultures look at ageing. It was curated by Dutch curators Lennard Dost and Mare van Koningsveld and commissioned by Valletta 2018 and Leeuwarden 2018, partner European Capitals of Culture 2018. It asked how societies deal with an ageing population and what role do senior citizens have in different communities. The highlight was a series of films screened in a popular residential area in Valletta, namely the Camarata Building on Merchants Street, which allowed for a mix of audiences and opinions in a way that challenged convention on participation of cultural events and the segregation of audiences according to class or education. Another venue was St James Cavalier cinema which developed a space for exchange by inviting different audiences to share this institutional cultural space. Another project worth mentioning is Beltin, which in turn was linked to a series of youth identity workshops, once again exploring the interaction between changing identities in communities against the urban fabric. Artist Zvezdan Reljic inspired Charmaine Zammit to note her fascination in observing the synchronicity of the artist and the community through a creative process where Elise Billiard’s documentation, the context of old and contemporary Valletta, the community of Valletta residents and photography came together. The contribution of the Valletta 2018 Foundation to the regeneration of Valletta through particular projects, referred to as flagship projects, is gaining visibility and support. These include the revitalisation of the covered market (is-Suq l-Antik tal-Belt) in Merchants Street, the conversion of the old civil abattoir (il-Biċċerija) into the Valletta Design Cluster and the regeneration of Strait Street into a vibrant cultural hub (http://valletta2018.org/infrastructure-projects/). These projects are in line with the vision that a visit to Valletta should be a unique experience in a positive sense. This is a challenge which Valletta 2018 purposely takes on in branding itself as a unique city, in spite of all the infrastructural and mobility difficulties it offers its residents and numerous visitors. Another flagship project is Muża. Work on the relocation and development of Malta’s new museum of art by Heritage Malta is underway. This applies to the complete rethinking of the National Museum of Fine Arts in South Street into a national community art museum at Auberge d’Italie in Merchants Street. The ongoing community curatorship programme is developing new audiences among residents and visitors as the project continues to empower diverse social categories to recognise art and museums as a resource. A core team, led by senior curator Sandro Debono, has launched the first pilot project in collaboration with Valletta Forum, an informal platform for city dwellers coordinated by Valletta 2018. The team is collaborating with community leaders to empower access to art beyond knowledge levels and weave stories of relevance together with these communities (http://heritagemalta.org/muza/community-creating-a-museum-together/). With two years to go to 2018, Valletta 2018 encompasses all of Malta and Gozo. A key project enabling the greater and more varied use of cultural spaces in Malta, totalling more than 4,000 across 68 local councils, is the cultural mapping process. It has created a valuable information database which maps the cultural use of public and private spaces across the islands by delivering an interactive online map and an academic publication bringing together academics and specialists from a number of relevant fields (http://www.culturemapmalta.com/). At this stage of preparations, the high level of urban regeneration in Valletta, as well as beyond, calls for a clear set of guidelines to set a road map which will establish a sustainable and valuable legacy beyond 2018. The Valletta 2018 Foundation looks forward to the publication of the Valletta Master Plan by government for public consultation following various detailed discussions held among state entities. The foundation also calls for the necessary human, financial and time resources to be dedicated to issues related to sustainable development including enhancing community ownership of residential and commercial spaces in a responsible way and striking a balance between cultural ecosystems which need time and nurture and large investment projects with an eye on international business and tourism. With the whole of Malta hosting the title of European Capital of Culture in 2018, the attention given to our capital city is to be extended to all localities. This applies particularly to the areas surrounding Valletta, including the urban sprawl around Marsamxett and the Grand Harbour which offer both a natural and manmade extension to the cultural nexus in the peninsula. The growing number of education projects, like the American University of Malta in Bormla and Żonqor as well as other existing and potential international campuses which may increase our academic attraction across Europe and the Mediterranean, further infrastructural development addressing tourism in the south in the form of hotels or holiday complexes, and the much awaited improvement in the cultural and sport-related structures which can offer creative and alternative spaces for recreation and interaction around Valletta, should all form part of a holistic, long-term plan. The success of Valletta 2018 will depend on the improved and sustained level of well-being of its citizens and visitors that is possible if cultural, economic and social regeneration address, in a sensible manner, people and their spaces.